← Can Gamification Be Saved? 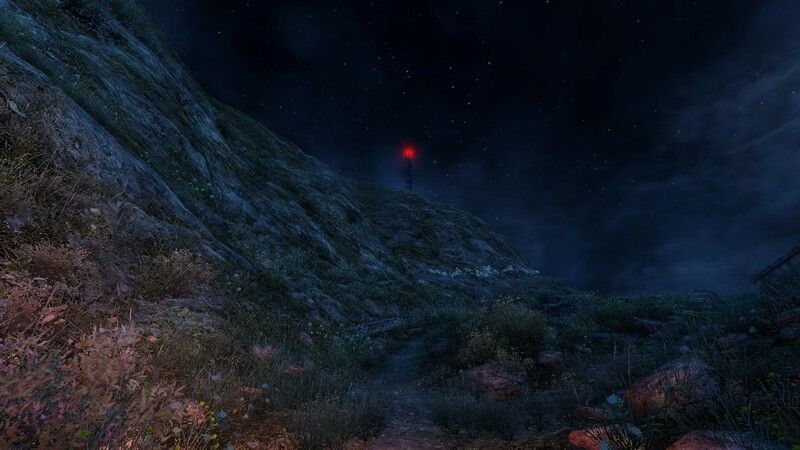 I played through Dear Esther again. In my initial post, I made some assumptions and arguments about the storyline that was going on in the game. I have to tell you right now, at the top of this post, that I was wrong. In fact, I played the game again, and I came to absolutely different conclusions about the narrator and the fictional conditions that created the world that he lived in. I started writing this post as a way of telling a new story. In fact, I just deleted 500 words of plotline. I was going to tell you about Donnelley and Jacobson and the illness they had and what that means to the narrator (who I had named N., like in a Kafka novel, to simplify my story.) But I was reading my notes from my second playthrough, and it felt disingenuous. The story feels too big, and even if I copied the words down straight from my page, it would somehow miss the point. We have a long tradition of theorists and philosophers explaining in great detail that the world is too big, that language always has an excess, that a mere fraction can be captured. And I am afraid that if I tried, even if I took tens of thousands of words and posted a screenshot of every ten seconds, that I couldn’t communicate it to you. I can’t make words that would approximate the feelings I had while playing the game, and it was only better the second time. 1. The chief concern in the game is the death of Esther, the narrator’s wife. She died in a car accident, and a man named Paul was responsible. The narrator tells a story of meeting Paul, and claims that he was “beyond any conceivable boundary of life.” The man was consumed by guilt, and the narrator says later that he finds himself “increasingly unable to find that point where the hermit ends and Paul and I begin.” The hermit, as we are told, came to the island in a boat without a bottom and died there at an incredibly old age. He is a dead mythological figure, and the narrator thinks that he and Paul are the same. He left his body to the medical school and was duly opened out for a crowd of students twenty-one days after his passing. The report is included in my edition of his book. The syphilis has torn through his guts like a drunk driver, scrambling his organs like eggs on a plate. But enough definition remained for a cursory examination and, as I suspected, they found clear evidence of kidney stones. He is likely to have spent the last years of his life in considerable pain; perhaps this is the root of his laudanum habit. Although its use makes him an unreliable witness, I find myself increasingly drawn into his orbit. 3. I like the surreal, dreamlike qualities of the game. I like the idea that time collapses for the narrator and for the player. My original post made a mistake because I took the end of the game, where the narrator says “Esther Donnelley,” as a moment of revelation. I thought it “solved” the story in that it gave a name and psychosis to the player/narrator. But I know I was wrong. Everything has collapsed–history is gone because everything is happening, will happen, and has happened. The deep past is present on the island, which feels post-apocalyptic. Everything is in ruins, even though the narrator says he lives there. In my final dream, I sat at peace with Jakobson and watched the moon over the Sandford junction, goats grazing on the hard shoulder, a world gone to weed and redemption. He showed me his fever scars, and I mine, between each shoulder the nascency of flight. There were chemical diagrams on the mug he gave me coffee in; sticky at the handle where his hands shook. . . . You could trace the connections with your finger, join the dots and whole new compounds would be summoned into activity. 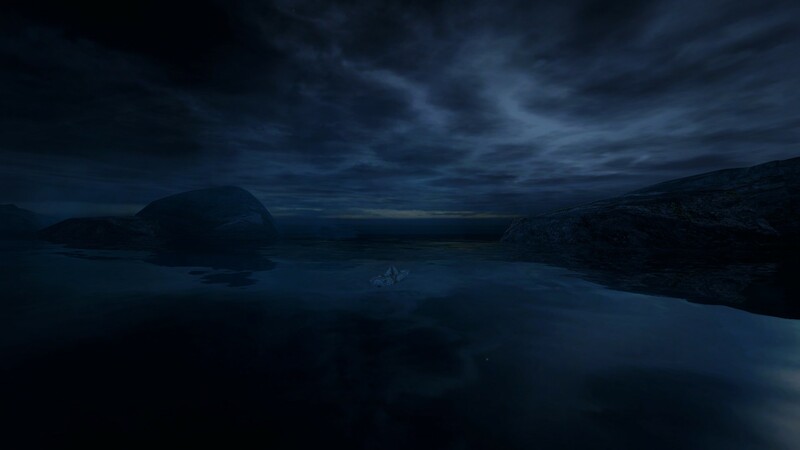 This is the act of playing Dear Esther. It is flailing in the dark, connecting the dots with your mind and input organs, trying to force meaning out of it. It actively resists meaning anything at all, and there is something comforting in that. The game, by the very nature of its structure, renders itself opaque to us. The multiple narratives, driven together by random number generation, crash into our minds. It renders our interpretive mechanisms sharp yet ineffective. I have read some beautiful interpretations of the game, but they are all wrong, simply because they exist. A sound of torn metal, teeth running over the edge of the rocks, a moon that casts a signal. As I lay pinned beside you, the ticking of the cooling engine, and the calling from a great height, all my mind as a bypass. 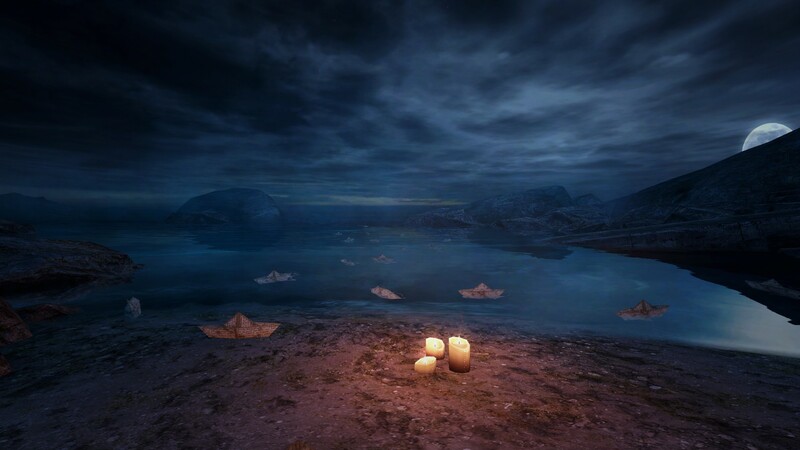 This entry was posted in General Features, Video Games and tagged dear esther, meaning, theory, video games. Bookmark the permalink. First off, this one’s an awesome review. 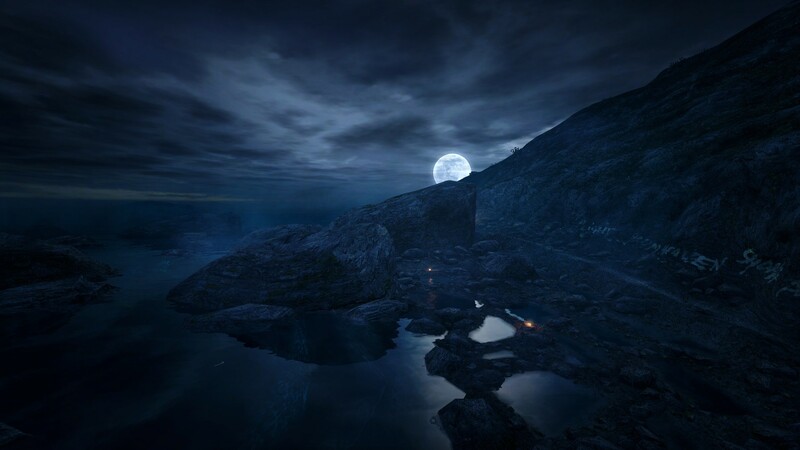 I’ve played the old, Source SDK 2006 mod, version of Dear Esther just now, twice to make sure I’ve got all of it. The ‘1st person’ person is Esther. It’s the only female we get in the story, and it’s a female silhouette we witness in-game, which shows us a few vantage points, then promptly disappears. It’s her alone that was supposed to read all the letters, so it’s either her or the writer, who is already dead. That’s all I’ll mention before my syndrome of seeking deeper meanings takes over. I think that is a pretty smart reading, but I think there’s too much textual evidence to suggest otherwise. The narrator (who you call the ‘1st person’) explicitly says that he is the one who has cast the boats into the ocean, and we see the aftereffects of that, which leads me to believe that the narrator has to be a “he.” There are a number of other reasons why the narrator is actually embodied in the first person, as well, but I think that the entire last section of the game is telling to that point – “he” is obsessed with the aerial, and when the 1st person climbs up the tower, I think it is solidified that the narrator is the letter writer, the one who misses Esther. “he is the one who has cast the boats into the ocean, and we see the aftereffects of that” ← but 1st Person didn’t do it–you didn’t do it, right? 🙂 It was not the player. The obsession, that even you felt through the catchy script of the game, might have contaminated 1st Person’s thoughts, as well. And after all, there is really nowhere else to go but the aerial in the end. The narrative says so directly, about the longed-for perspective, and all. Gah, this is making me look for deeper meanings now. And it /might/ have been Esther’s shadow crushing my recreation. Or it might have been kunzelman, or kaens, feeling so story-involved as to actually repeat the jumping experience. The island is part imagination, as well, what with the Soviet cars underwater. None of this matters either way, I’ll just stop at that… and, I guess, buy the remake, now that I’ve seen how much script and polish have been added. I think the idea that the player isn’t the same as the narrator is brilliant, but I would need some more textual analysis before I commit to that reading of the game. I think the march to suicide at the end of the game means that the narrator and the 1st person are one and the same, and I don’t think it is merely the 1st person living the pain of the narrative and then committing suicide. The idea that the narrator is not embodied by the player is really great, but I think there are too many design choices in the game that assert that these two presences are the same. Walking speed and the ability to fall down cliffs when you misstep seems means that the narrator is a physical presence. Another design issue is the choice to make the 1st person character climb the aerial by itself–I think it forces us to confront that it is the narrator, a physical presence, not merely an island ghost or player interloper. 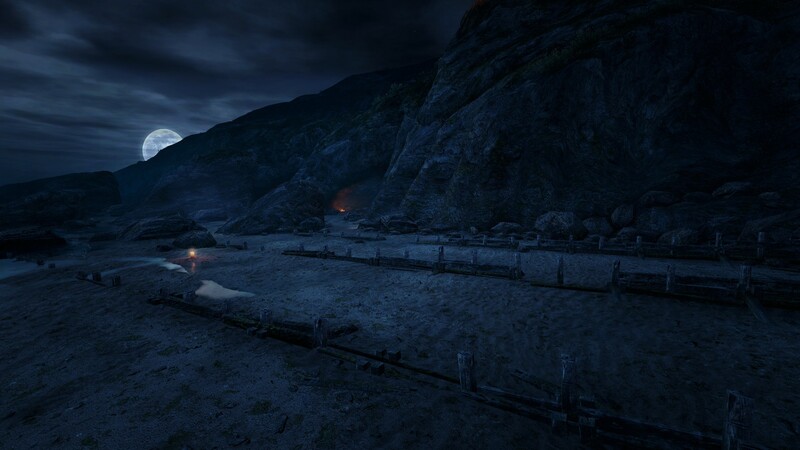 Instead of a recreation of prior events, I think the game’s chronology is simply that the narrator, standing on the spot on the island furthest from the aerial, decides that he will kill himself. Then we play out that death march. I think that chronology is most supported by the paper boats. Paper boats sink, and quickly, and so it couldn’t be that long from when the boats were launched to when the narrator killed himself. No, no, the laws of physics work on everyone, not just the narrator! Even the ghosts, on a theory that that was the case, in a psychological manner. I didn’t noclip around, that’s for sure. I didn’t necessarily mean that 1stPerson was disembodied, however, because Esther’s car accident could’ve ruined the narrator without actually killing the victim (but we’ll never know). As for the forced climbing–it could have been for a very prosaic reason like not wanting the uncontrolled player jumping in the wrong direction, ruining the moment… or something entirely different but engine-related. The least of all does the game want to give you choices, after all. As for the paper boats, yes, they would normally sink before our very eyes, so that’s probably like those cave cars. Also, that broken boat floats, if you care to check. I think that everything you point out is true. I think you should make a blog post or something to really flesh it out–it could be a really interesting take on the game if you were really specific. The only thing I would say is that “Come back, Esther” could be read as “come back/ Esther,” which I took to mean that he has to return to the journey toward his death and toward Esther. 1) Summary: Esther is the narrator’s wife or something to that accord. Paul hits her with his car. Possibly in an attempt to avoid that, he sends his own car off a cliff, then either counts minutes until ambulance to come or loses consciousness (unclear). The narrator later meets Paul, a scientist. He steals a book about the island from the library, starts going there often, associating himself with the place. The crazy tale of a hermit in a boat without a bottom and the book of a dying man on an opiate, also possibly the island’s disease and his own medical “treatment” of his wounded leg, get at his already unstable sanity, and he jumps off the aerial, trying to disappear, to become one with everything instead. 2) The full game changes the idea that the island is illusionary. The cars that used to simply be there in a cave are now the protagonist’s vision, the boat can’t float anymore, and the candles appear. The candles give the whole thing a touch of a ritual, including clusters of them around the portrait, the car photos, a car’s remains, and all of the medical equipment involved throughout. I also thought a bit and realised that the scientific-like graffiti are in fact primitive and might only convey their author’s obsession and that he is definitely not a science person. 3) The candles either rule Esther’s ghost version out, only leaving us with the narrator’s and Paul’s shoes to walk around in, or are just as ghostly as her. The scene of ascension away from a car accident hints at Esther’s ghost, as well as does the final camera that doesn’t really finish the physical fall with a sprawled body and blood. Paul might have found the letters, but “Come back/Esther” wouldn’t be in his mind, so that’s out too. Aw. 1) Narrator = protag, the island’s completely real. Doesn’t explain the paper ships not sinking, the car accident ascension scene, the final non-splatter scene, and the way the protag doesn’t feel his sick leg as such. 2) Esther = protag, parts of the island are surreal, including the candles and, indeed, the car’s remains on this god-forsaken island. The other discrepancies also go away. But, again, we have to accept the island’s surreality. Oh well, not that it’s any less pretty for that. I still think that the narrator is the protagonist, but I think it could go either way. I think the analysis you’re doing of the game is really smart stuff, and it has definitely caused me reevaluate the way I thought about the game. Maybe it is just that I really want the island to be real and for everything to be a solid entity. I could just be old fashioned. The island has lots of tunnels carved out of it, with many things marked on the walls, words, diagrams. There are plenty of chemical diagrams, which the narrator talks of learning whilst waiting in a waiting room(?). There are diagrams of what look like nerve cells (to me). There are also electrical diagrams. Perhaps the island is the narrators mind? Maybe Esther on his mind. The bible story referred to is the conversion of Paul on his way to Damascus. Paul was out to arrest the followers of Jesus, but on his journey, the Lord spoke to Paul and a light shone around Paul. Through this Paul was converted. Paul was relieved of the desire to arrest others. As the player nears the tower, these religious references become more frequent as if to emphasise a prevailing thought. Maybe the path is leading to some sort of acceptance that Paul eventually came around to. The act symbolised by the player (maybe Esther *shrug*) jumping from the tower, becoming a bird and setting out to sea. Perhaps it is the narrator letting go of Esther, Esther leaving. Perhaps it is the narrator himself fleeing the lonely island and all the Hebredian History that the narrator/player is surrounded by there. That said, the narrator doesn’t seem to have any ill regard for anyone. Otherwise, I enjoyed it. I wish there had been more substance to keep me intrigued however. I can only see the same unexplained, unreconcilable diagram on so many walls before it starts to get fed up with it. If I could relate things, I would feel better about it. Just finished it. I don’t think the Island is real. Nothing makes sense. Car parts? Bunch of lit candles? Ghosts watching you? The bottom of the lake highway scene? About that scene… I played it twice. First time I saw “the accident” (couple of cars on the road) and the second time I saw a stretcher and IV thing). Never mind all these *huge* drawings everywhere on the island. I’m not sure it’s realistic to expect one man to draw all this .They were all “recent” drawings (chemistry,electricity,etc.) if I’m not mistaken. I doubt The “hermit” or “Jackobson” (or are they the same person? I forget.) knew about that much science 100-200 years ago.Although I just realized that they could be responsible for the religious drawings.Hmmm..
Also, as was mentioned earlier, you hear “Come back” every time you try to go out of the “game world”. Esther is trying to “come back” to the real world and just can’t. I believe this is all happening in Esther’s mind as she is dying. We are “following” Esther last, pardon my french, brain dump. The narrator (henceforth, N.) and Esther were in a collision. Paul was driving the car that struck them. There was a period of time between the collision and the arrival of the paramedics where Paul and N. had some sort of limited interaction, but it sounds like Esther may have been dead at the scene. N. descends into a deep depression. He becomes engrossed in tiny details regarding the accident; the circuitry of the antilock brakes that may have failed to operate properly. N. begins obsessively traveling the stretch of road where the accident took place looking for evidence of the accident, an accident which had such a massive effect on his life, but failed to leave a mark of distinction on the site of its occurrence. Eventually, he visits Paul in his grief. As you might expect, the meeting went poorly and did not bring about a catharsis for either of them. How N. knew about the island, I can’t say. I don’t know if he had ever visited it before or only knew of it from the book. But when you are deep in grief, solitude beckons you. For some reason, he begins visiting the island and it seems that at some point, he had come to be there for some time; as evidenced by his books and camping supplies in the shepherds hovel and the fact that his batteries and supplies are running out. He also implies he is becoming gaunt. He is the one that has been decorating the island with the luminous paint salvaged from the belly of a wrecked freighter. N. eventually decides to commit suicide. The candles are lit by N, the small shrines are erected on his pilgrimage across the island as he makes his way to the aerial and then jumps to his death. But we are not privy to that experience. We are playing as N’s. ghost, who traipses across the island to recommit the act nightly. The candles have long since been washed away, the paper boats are long sunk, but we experience them as part of N.s memories. 4. When N. falls from the tower, the speed is much slower than one would expect. Again, non-corporeal fall? And then, of course he never hits, he banks away, out over the ocean, with the shadow of a bird beneath him. Perhaps wending his way back towards the lighthouse to restart the cycle?